In the previous article, Introduction to Badminton Tournament systems-Round Robin, the round-robin system, often used in amateur competitions, was introduced. This system makes both formal competitions and practice more fun. In this article a system often used in major international tournaments—the single elimination system—will be introduced. 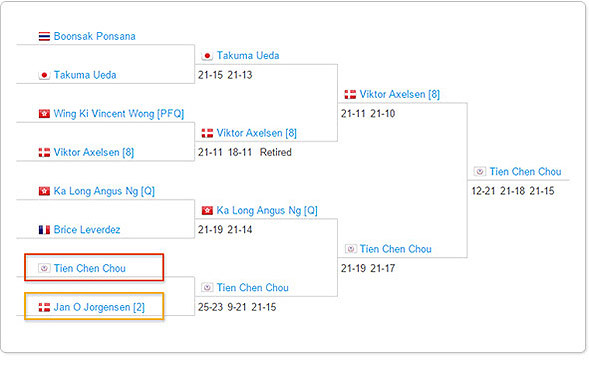 Do you know what tournament system is used by BWF "Super-series"? IAs the name suggests, when the single elimination system, is used a player/pair/team is knocked out of the tournament if they lose once. 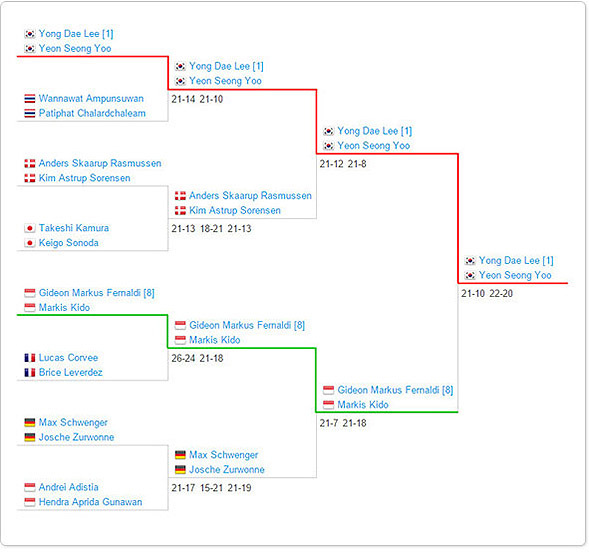 In the illustration above, Korea’s Lee Yong Dae/Yoo Yeon Soeng (red line) needed to win every match to win the title; Indonesia’s Femaldi/Kido won (green line) won the first two matches but, losing in the third, they were eliminated from the tournament like the pairs that they had previously beaten. In other words, the winners of a tournament that uses this system will have won all their games on the way to winning the final. They may have lost games but they certainly won’t have lost a match. This system is often used in tournaments in which a large number of players or teams are taking part because its most striking characteristic is” speed”. As it requires fewer matches be played than other systems, a tournament can be completed in a shorter amount of time. A. If the single elimination system is used, the number of matches required is just 7 (shown by the red arrow in the illustration below). B. 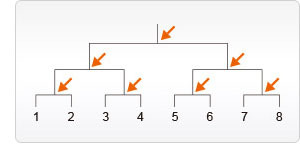 If double elimination is used, 14 matches must be played. C. If a mixed system is used (first round robin in two groups, the top two team of each group can enter to the second round which use single elimination) 15 matches must be played. D. If the round robin system is used, 28 matches need to be played. As the number of players/teams increases, the difference between the number of matches each of the systems require will widen. 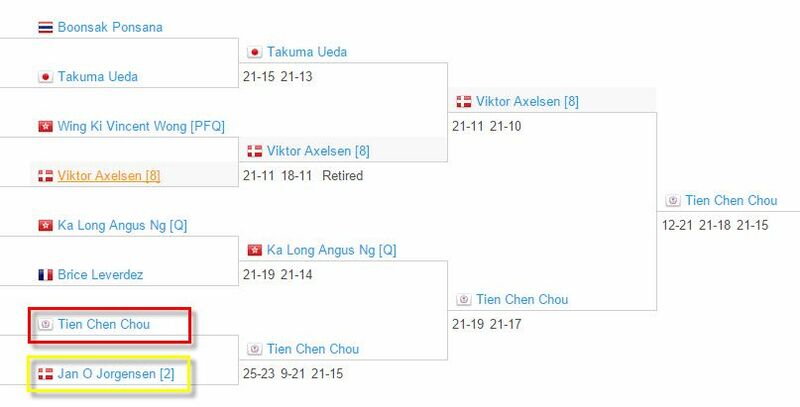 If you hold a badminton tournament with 32 teams competing today but don’t want it to drag on too long, the single elimination system is perhaps your best choice. This system involves more luck than the other systems. The draw may pit two teams that have a hope of winning the tournament up against each other early on, with the losing side exiting the competition. This means that although the champion produced using this system is undoubtedly highly talented, the winners of the runner up spot downwards is likely to have been decided by an element of luck. The shortcoming of this system can be corrected by using a seeding system. In accordance with the results of the previous tournament, the more powerful players/teams are seeded (shown in the box below). The players marked with a number are seeded and are put into separate pools to avoid them meeting each other too early. 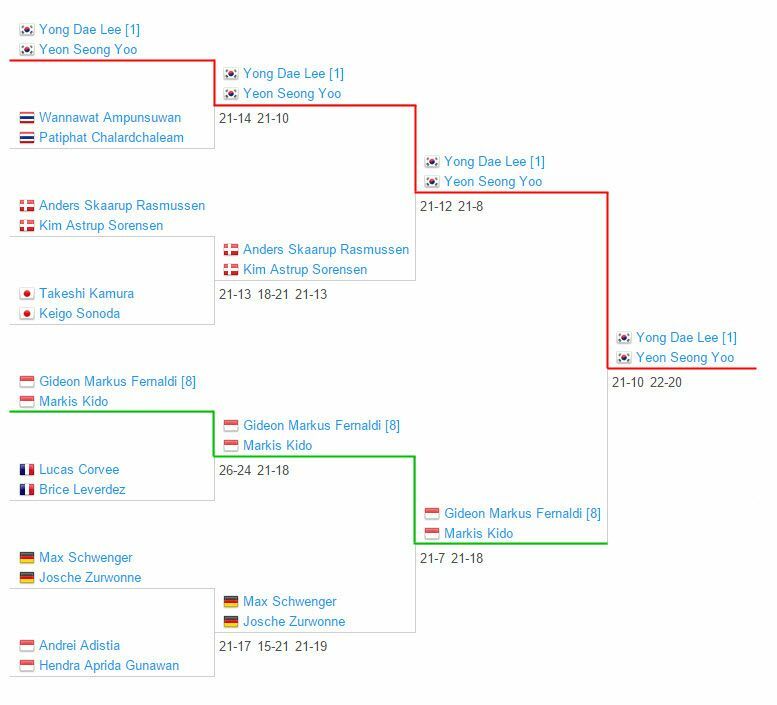 With the seeding system, if a seeded player is eliminated early it is reasonable to suggest that a dark horse has appeared in the tournament (Unseeded Victor Star Chou Tien-Chen in the red box defeated a seeded player,) making the competition more watchable and giving it more talking points. Using the single elimination system, every match is the last one for one player/pair/team; the players know that if they lose they can pack their bags and go home, so they all try their best, making play more exiting. Want to experience the thrills and tension of the single elimination system? Why not organize a tournament using this system and see how much fun it is!